The Tenchugumi rebellion of 1863 in Nara Prefecture, Japan, and the Ikuno uprising in Hyogo Prefecture came at the height of the campaigns of the pro-imperial forces fighting to bring about the downfall of the Bakufu government and restore the Emperor to the seat of power. The culmination and slow birth of revolt stemmed from the Tokugawa family’s increased inability, over its 260 year history, to provide for the people and curtail the long-standing economic suffering of the masses. Such dissatisfaction for the Shogunate was ignited over a decade earlier with the 1853 visit of Commodore Matthew Perry’s black ships and the Shogunate’s subsequent approval of the opening of the nation to foreign trade. Further fuel was added to the fire with the news that the Shogun’s decision was made without the prior approval of the Emperor. The resultant aftermath of these two incidents marked the gradual decline and effect of the insurgent actions that such groups, as the Tenchugumi, throughout the nation of Japan had been employing against the Shogunate’s forces. With a message of ‘exclusionism’ and the use of anti- shogun tactics, the Tenchugumi tried to establish a government in Yamato province (now Nara Prefecture) with the Emperor as the head. Led by the charismatic presence of Tadamitsu Nakayama, the Tenchugumi rebellion was carried out by a little over a thousand men of various social standing. Clansmen (Hanshi), country samurai (Goshi), who remained in villages and engaged in agriculture, farmers, and village officials (Shoya) were all a part of the varied make-up that was the Tenchugumi. Other leading figures that rose to the forefront of the rebellion were Keido Matsumoto of Aichi Prefecture, Tetseki Fujimoto, Goro Azumi, and Nigori Zenemon of Kawachi. Yet, the man most responsible for the group’s organization and guerrilla methods of attack was Yoshimura Toratarou, a former Shoya of Kochi. In using this method, Toratarou and Nakayama were able to raise a force of over a thousand men quickly. Successful in their first battle, the Tenchugumi drove off the forces loyal to the Shogunate, occupying the Gojo Magistrate’s Office. In the process, a bailiff for the Bakufu and four assistants were killed. Their heads were then exposed with denunciatory placards pronouncing the region under the direct rule of the Emperor. Promises of a 50% cut in taxes and general permission to assume family names and swords were held out to attract further support. Yet the taste of victory was soon be a fleeting memory, short-lived. The very next day, the Shogunate dispatched forces to crush the Tenchugumi rebellion. With sudden political instability engulfing the area, the planned visit of Emperor Komei was quickly cancelled. 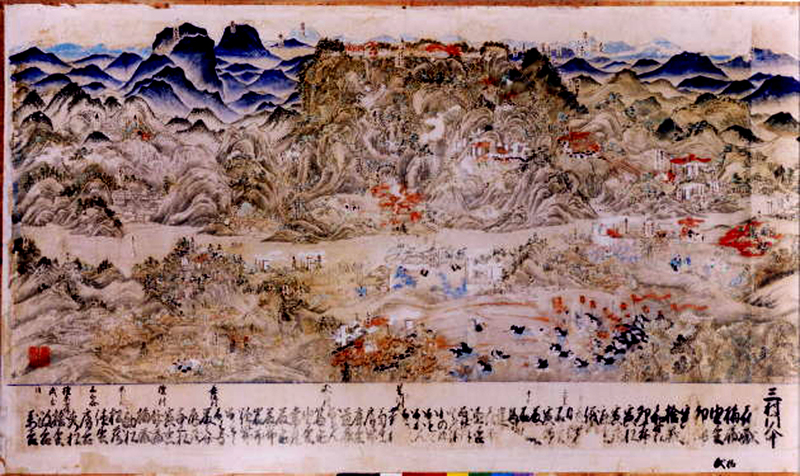 Troops of the fierce Satsuma/Aizu clans united and clashed with the men of the Tenchugumi in violent battle. Outnumbered, the Tenchugumi forces found themselves in sudden retreat, fleeing for for an area of safe-haven, sympathetic to their cause. On August 21st, 1863, the Shogunate ordered the Koriyama feudal clan to join the hunt to annihilate the Tenchugumi forces. A few days later, several more clans were ordered by the government to fight the Tenchugumi, raising the Shogun’s forces to over 13,000 men. After several days of retreat, the remaining force of Tenchugumi fighters rendezvoused at Totsukawa village, where loyalty to the Emperor was still strong. With help from villagers in Totsukawa, the Tenchugumi regrouped and quickly revised their plan of attack. The momentum of rebellion had be kept in motion, in order to continue to sway support of the locals. The men of the Tenchugumi therefore refocused and, on August 26th, attacked Takatori Castle. The fighting was fierce, yet the arsenal of guns available to the troops of Takatori Castle, overwhelmed the traditional weaponry of the Tenchugumi fighters. Once again, the battle-weary survivors of the rebellion were forced to retreat and flee for their lives, further driving them into a corner. From Kurotaki village to Shimoichi Cho to Kawakami village, the Tenchugumi fought off their pursuers. Yet, as the Tenchugumi broke up, the poor farmers of the surrounding areas they fled and fought through, pursued and attacked them as well. Many Tenchugumi fighters were killed, yet there were survivors, those of which took to escaping and hiding in sympathetic areas, such as Iga province (today known as Mie Prefecture), areas where the hunted and the outlawed were known to find shelter and secrecy through centuries past. On September 25th, 1863, Yoshimura Toratarou, the charismatic leader of the Tenchugumi, having witnessed the rebellion crushed, committed seppuku (ritual suicide) in a small farmhouse in Higashi Yoshino Village, officially bringing an end to the rebellion. The fight brought about by the Tenchugumi showed the same characteristics as the Ikuno revolts, near Kobe, that followed. Yet, although this brought the opposing factions together against the feudal government, it did not represent the poor farmers. The Ikuno uprising broke out with Nakajima Taroemon, a Shoya, as the leader, but was soon quelled in a few days. The revolting farmers not only pursued, attacked and killed the members of the alliance, but broke into the homes and destroyed property. Casualties consisted of 14 wounded including, 4 Shoyas, 2 brewers, 1 doctor, 2 rice dealers, 2 shopkeepers, and drapers, 2 wealthy farmers, and 1 unknown. Concerning the historical memory and the views held of the Tenchugumi by the people of Japan, many see the rebellion as an erroneous and rash act perpetrated by a violent group of extremists, who slaughtered many innocent citizens. But, investigating deeply, when one researches the personalities of the men involved, the social and political upheavals of the time, culminating in the formation of the Tenchugumi, one will see the purity of reason within members of the rebellion and the gallant belief in their cause. These were young and passionate men in their twenties, ranging from loyal clan retainers to local priests, different in status, but sharing the same fire within their hearts to induce change within an oppressive system they all were forced to live under. And, though the Tenchugumi collapsed in death and defeat, the wolf-fire that they ignited was fanned and carried on by similar rebellions to follow, all of which contributed to the eventual downfall of the Tokugawa Shogunate and the restoration of the Meiji Emperor.